When the 94 sectors of the 14 regular polygons of the inner Tree of Life are turned into tetractyses, 236 yods line the 83 sides of the polygons. The 2-dimensional Sri Yantra comprises 68 vertices and 126 sides of the 42 triangles surrounding its central one, that is, 236 geometrical elements. In both cases, the parameter 236 quantifies form — either the number of yods lining the sides of the 14 polygons or the number of geometrical elements in the 42 triangles of the 2-dimensional Sri Yantra that surround its central one. 231 = 1 + 2 + 3 + 4 + .... + 21. This is how EHYEH, the Godname of Kether with number value 21, prescribes the shape of the polygonal version of the inner Tree of Life. Sandalphon, the Archangel of Malkuth. The appearance of a number associated with the Sephirah Malkuth is highly significant because the Type B dodecagon has 168 yods other than its corners and centre, where 168 is the number value of Cholem Yesodeth, the Mundane Chakra of Malkuth (see here). Outside the root edge of two enfolded Type B dodecagons are 46 corners and 118 sides (22 polygonal) of 72 triangles, that is, 68 corners & polygonal sides, leaving (96+72=168) sides & triangles. This 68:168 division in its (46+118+72=236) corners, sides & triangles corresponds to the 68 vertices & 168 sides & triangles in the 42 triangles of the 2-dimensional Sri Yantra discussed earlier. It also corresponds to the 68 yods lining the sides of the two enfolded dodecagons and the 168 yods lining the sides outside the root edge of the first (6+6) enfolded polygons. Moreover, 168 yods are associated with each enfolded dodecagon other than their 22 corners (see (7) under heading "Type B dodecagon" here). Indeed, 155 hexagonal yods are associated with each enfolded Type B dodecagon, where 155 is the number value of ADONAI MELEKH, the complete Godname of Malkuth (see (2) under heading "Type B dodecagon" here). Here is a chance-defying conjunction of three numbers (155, 280 & 168) that are associated with the same Sephirah Malkuth! which, appropriately, is the total number of geometrical elements composing the form of the two enfolded Type B dodecagons, including their shared side. This is amazing evidence of the transcendental design of the Tree of Life, implemented by the Divine Names. Face 4: (integer 24 at centre): all integers belong to Faces 1, 2, & 3. We see that, when the natural ordering of faces is followed according to the increasing sizes of the integers at their centres: 6→8→12→24, the 11 red integers in Faces 1 & 3 add up to 168 and the 4 blue integers in Face 2 sum to 68. The 68:168 division, which we saw above is characteristic of holistic systems, therefore, manifests as well in the Tetrahedral Lambda in the various sums of new integers on edges of its first three faces. Moreover, the number 168 splits into two 84s generated by Faces 1 & 3, a division that is also characteristic of sacred geometries. For example, in the case of the inner Tree of Life, there are 84 yods lining each set of the first six enfolded polygons and, in the case of the 2-dimensional Sri Yantra, each of the two sets of 21 triangles surrounding the central one has 84 sides & triangles (see here). Their counterparts in the E8×E8 heterotic superstring are the 84 turns in a quarter-revolution of each helical whorl of the UPA about its axis of spin, as described over a century ago by Annie Besant & C.W. Leadbeater (see here), i.e., each outer or inner half-revolution of a whorl contains 168 turns. We found earlier that the inner Tree of Life embodies the number 236 as the number of yods lining the sides of its 14 enfolded regular polygons, there being 68 yods on the sides of the pair of enfolded dodecagons and 168 yods on the sides of the first (6+6) enfolded polygons. How does the outer Tree of Life embody this parameter? As it contains only 214 yods when its triangles are Type A, the number can only be a parameter of the 1-tree, which has 251 yods. Let us now analyze how they are distributed. Constructed from Type A triangles, the trunk contains 80 yods, where 80 is the number of Yesod. Hence, it has 70 yods other than the 10 yods located at the positions of the 10 Sephiroth. Two hexagonal yods lie on the "line" making up the trunk, so that 68 yods belong to the triangle & tetrahedron, that is, the components of the trunk that have shapes. They are shown in the 1-tree opposite as blue yods. The branches of the outer Tree of Life are the lines & triangles outside its trunk. As the 1-tree contains 251 yods when its 19 triangles are Type A, its branches contain 251 − 80 = 171 yods. One of them is Daath of the 1-tree, which is Yesod of the next higher, overlapping Tree. Of the 170 yods in the branches that are not SLs, two green yods are hexagonal yods on the Path connecting Daath and Tiphareth. As the 1-tree is a 3-dimensional object, this line does not coincide with the root edge shared by the 14 enfolded polygons, which lie in the plane containing the two side pillars. Nor does the line connecting Tiphareth to the centre of the triangle with Chokmah, Binah & Tiphareth at its corners. It, too, contains two green hexagonal yods. The root edge is the projection of either line onto the plane of the polygons. Hence, the branches of the 1-tree have four green hexagonal yods whose projections onto this plane are the two hexagonal yods in the root edge. Including the two hexagonal yods in the "line" component of the trunk, (2+170−4=168) red yods outside these lines that are not SLs belong to the 1-tree. 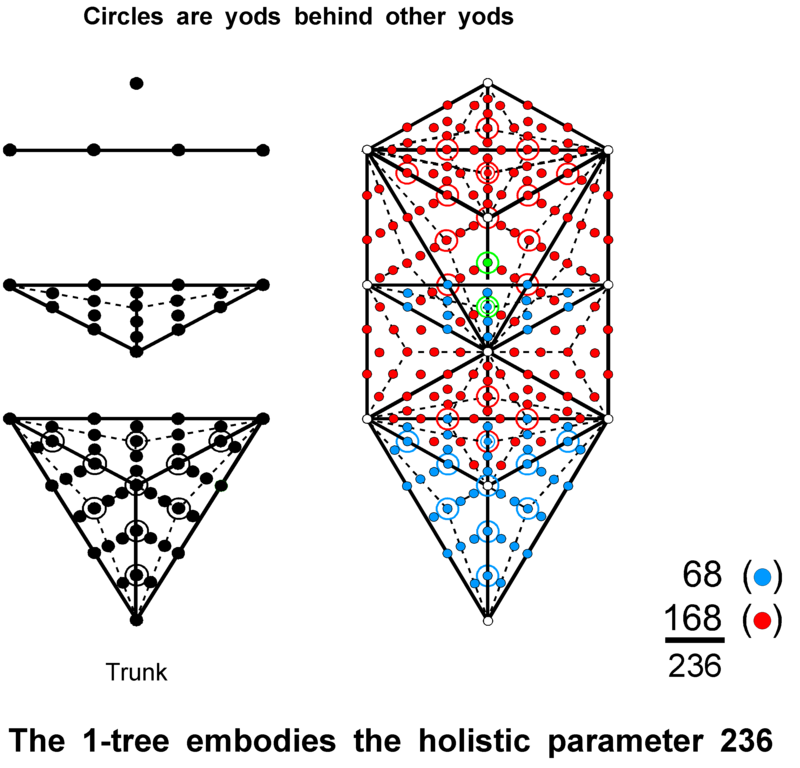 There are (68+168=236) red & blue yods in the 1-tree other than the 11 white yods at the positions of SLs and the four green hexagonal yods lying on sides of tetractyses that project onto the root edge. The 1-tree displays the same 68:168 division as that found above for its inner form, the 2-dimensional Sri Yantra, the Tetrahedral Lambda and the pair of enfolded Type B dodecagons. This is because they are all different manifestations of the same holistic system. The 68 blue yods making up the triangle and tetrahedron components of the trunk correspond to the 68 vertices of the 42 triangles in the 2-dimensional Sri Yantra, whilst the 168 red yods correspond to its 168 sides & triangles. The four green hexagonal yods are analogous to the three sides and lowest corner of the central triangle in the 2-dimensional Sri Yantra that are unshared with any of the 42 triangles composed of 236 geometrical elements. In each case, they represent the source of the information-encoded geometry quantified by the number 236. The bindu point at the centre of the triangle prevents the latter from being a proper one in the pure, mathematical sense of the word "triangle" because the point lies in the plane of the triangle, so that the 236 elements surround four elements in it, not five. This means that 240 elements surround the centre. They are the counterpart of the 240 yods in the 1-tree other than its 11 SLs. The two joined Type B dodecagons have 239 geometrical elements. The 2-dimensional Sri Yantra is analogous not to them but to two separate dodecagons, which have 240 geometrical elements surrounding their centres, as well as 240 hexagonal yods on the 120 sides of their 72 tetractyses. the holistic parameter 236 is arithmetically determined by the gematria number value 26 of the Godname YAHWEH because it is the sum of (10+6+10=26) odd integers. This is how YAHWEH prescribes the form of the inner Tree of Life determined by the 236 yods on the boundaries of the (7+7) enfolded polygons, as well as the shape of the 2-dimensional Sri Yantra with 236 geometrical elements surrounding its central triangle.